The EzyDog dog harness is a padded dog harness that features an EVA chest plate. EVA is a foam rubber that will form to the dogs chest for an ergonomic fit. Comes with seatbelt connector for use in the car as a dog safety belt. 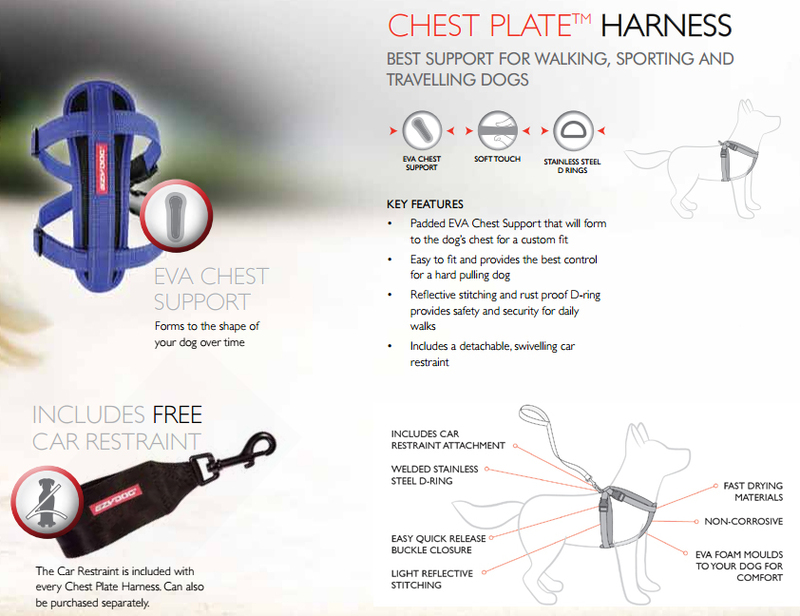 The EVA chest plate keeps the load of the dog spread across the length of the dogs chest providing comfort and control, not to mention style! This makes it great when used as a dog bike harness. 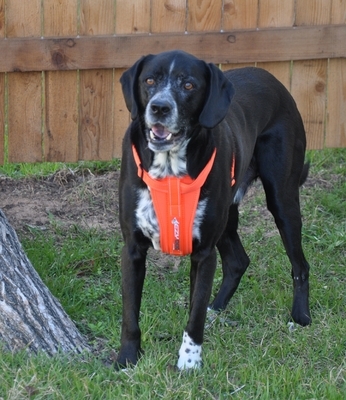 The EzyDog padded dog harness is adjustable and easy to fit. See the Fit Chart for the perfect fit. The EzyDog padded dog harness uses reflective stitching for enhanced visibility at night. A swiveling seat belt restraint is included for safe travels by automobile. A rust proof welded D-ring is used for attaching leashes. 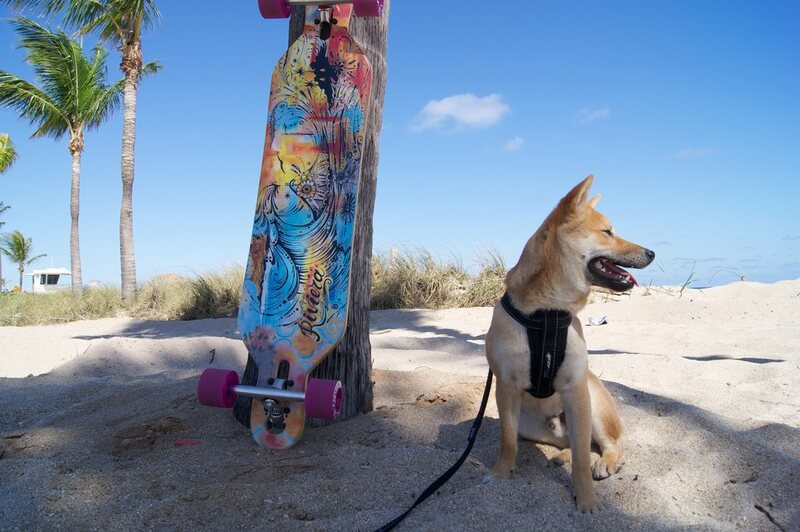 For ultimate control, use with an EzyDog shock absorbing leash. **Goes great with the WalkyDog Dog Bike Leash or Cujo Bungee Leash. 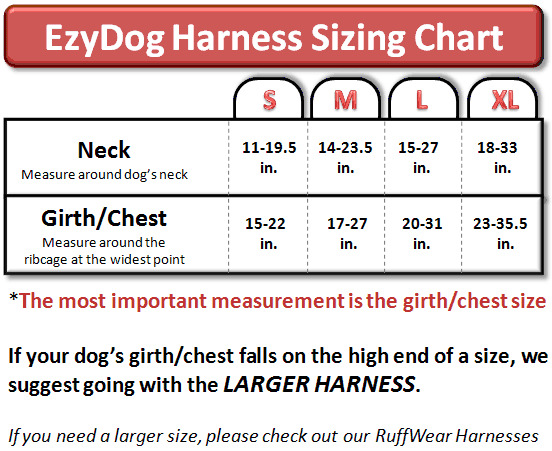 The EzyDog harness is a comfortable padded dog harness that conforms to your dog's chest. EzyDog harness can be used as a padded dog harness for activities like biking your dog or just as a comfortable dog harness to control your dog when walking. A padded dog harness will prevent rubbing and chaffing on your dog's skin. Many non padded dog harnesses you find at the local pet store are uncomfortable for your dog and will rub them raw. The EzyDog is padded across the chest area of the dog so that any tension is distributed across your dog's chest instead of up under the belly. The EzyDog goes great with the Walky Dog bike leash as a comfortable dog bike harness as can be seen in the video above. 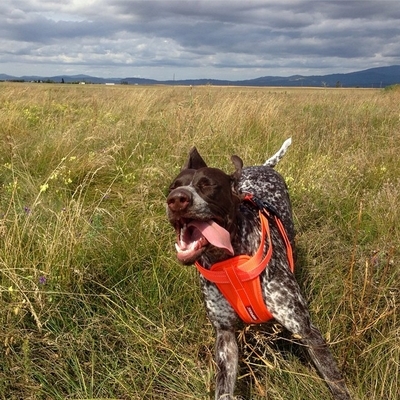 "I wanted a EzyDog Padded Chest Harness and emailed them to see if I could get one in Pink. I got a reply the same day telling me that they didn't carry them in Pink, but they would be happy to order one from the factory. I placed my order on a Wednesday for a Large Pink Harness with a 3 day special delivery and received it that Friday I was so excited to get it and upon opening it, I found the factory had made a mistake and sent me a Medium! I emailed them back Friday explaining that I had received the wrong size to which they were so apologetic and said they would correct it immediately. Much to my surprise Monday, I received a package from them with the correct size Pink EzyDog Padded Harness. I couldn't believe how fast and cooperative they were. It's a pleasure to know and do business with a company that cares about customers in this day and age like they do! The EzyDog Padded Harness is awesome. I love how it fits and doesn't chafe my Boxer/Lab behind her legs. It sure makes all the difference in how she handles now Great Company who stands behind their products with an A+ in support and service!! Just placed another order for the Walky Dog Plus Dog Bike Leash!" "My dog Galaxy is a stocky, pit bull mix. I have struggled with the standard collar-and-leash combination with her because her neck is bigger than her head and she can easily slip out of her collar on our walks. We have tried other, plain nylon harnesses without success -- she refuses to walk forward in them and can back out of them. 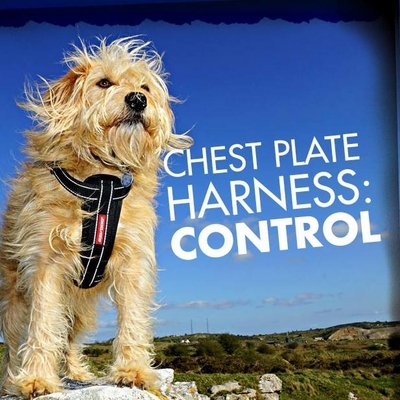 I was especially drawn to the EzyDog Padded Chest Harness because the video states that the chest plate prevents the dog from being able to back out of the harness. It also occurred to me that that plain nylon might be uncomfortable and chafe under her belly and armpits (she has sensitive skin to begin with). 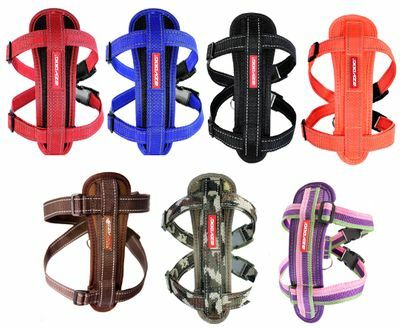 I purchased the EzyDog Padded Chest Harness and sprang for the Lali's Comfort Strap Cover. The harness was very easy to configure and put on her, and the strap cover was very to get onto the harness. Whether because of the the superior harness or strap cover (or both! ), Galaxy has shown no reluctance to wear her new harness! The pulling on walks is greatly decreased and I don't have to worry that she might pull out of her collar or harness at an unsafe time and get hurt. All in all a very good purchasing experience (the purchase arrived quickly and was exactly what I ordered). I highly recommend ordering the Lali's Comfort Strap Cover if you've had trouble getting your dog to wear a harness in the past. 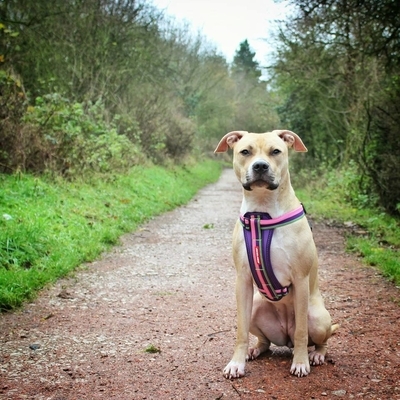 I have attached a picture of Galaxy's first outing to the woods in her new harness and comfort strap cover. Enjoy!" "I have a pit bull/boxer mix and she pulls like CRAZY. I tried the Halti and Gentle Leaders, I tried several different collars and this harness is the only one where I feel I'm not tormenting my dog. She's comfy, I'm happy walking her and she looks real cute in it." 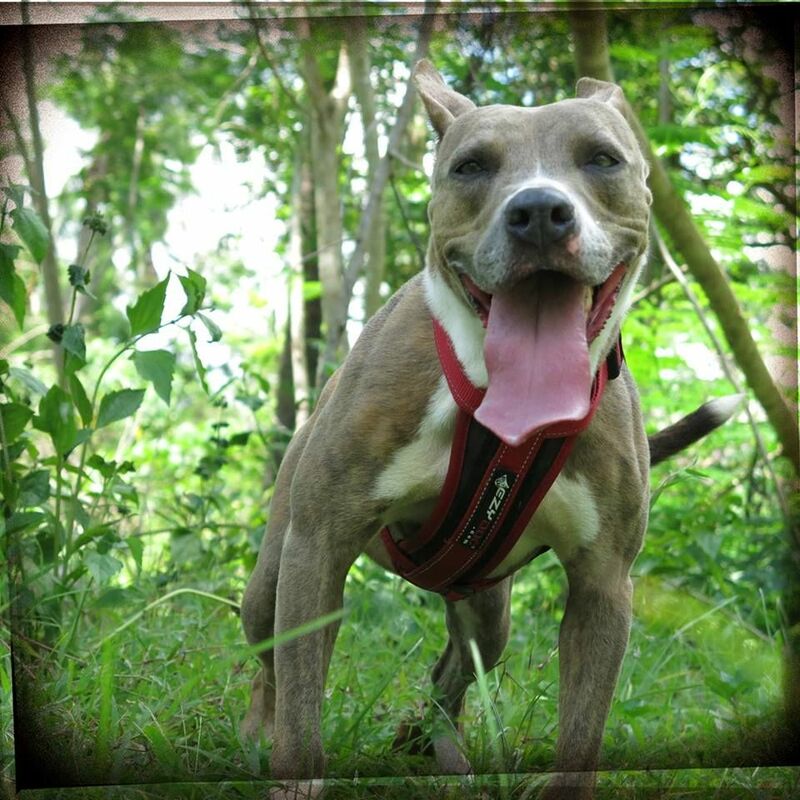 "I received this harness & we LOVE it! My dog is completely blind so the over-the-head harnesses are intimidating to her. Walk time is much less stressful with this harness and it's so easy to use. I'm glad we found something this helpful for our dog and this easy for us to use. Also, I loved the dog treat with the order, that was so cute. My dog loved it too! Thanks for your great service and Happy New Year!" "I have two medium size dogs and it is very hard to find an appropriate collar that is the proper weight but strong enough to hold my two four-legged friends when they: decide they are sled dogs; decide to chase squirrels or; can't wait to get home. 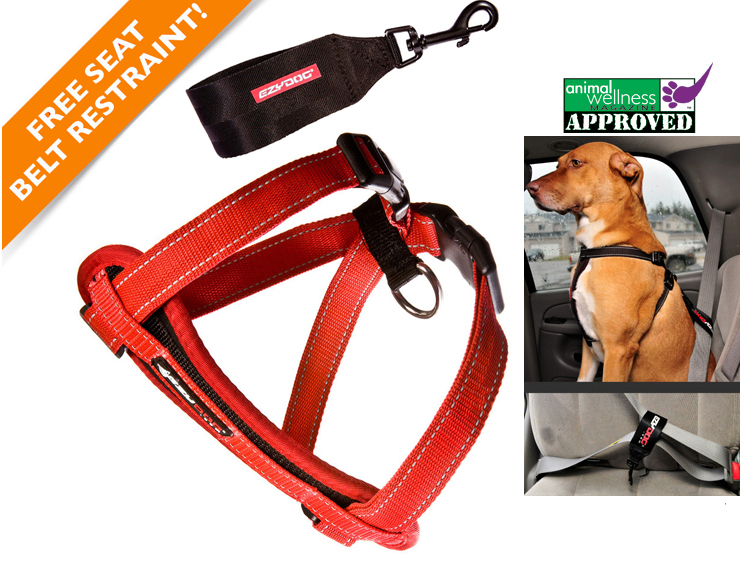 These harnesses provide the ideal combination of strength, weight and comfort for the dog when walking or in the car. I have tried others, including those bought at the big chain stores and those which were supposedly "customed designed". These are by far the best and curiously by no means expensive." "This is by far the best looking and functional harness I've ever bought. The design of the harness is awesome, as is the material. Due to problems with my bulldogs eyes, he's unable to ever wear a collar. I've bought many harnesses; none as good as the one made by EZYDOG." "I love this Harness so much, I bought a 2nd one just incase I lose the first. I have a English Bulldog who loves to pull when I got this product I thought there was no way I was going to be able to put it on him. I was wrong, it's so simple two snaps and that's it. Not only is it a great product my dog loves to wear it!" "I absolutely love the harness. My dog Dante is a shih tzu who travels everywhere with me. The harness gives him the freedom of riding outside a carrier and it gives me the satisfaction of knowing that he is restrained and safe incase of and accident. The harness goes on so easily, slipping over one leg then buckling. Dante loves the harness too, he seems to find it very comfortable and not too confining. He associates the harness with car rides, the second I take it out he gets extremely excited and starts barking with anticipation. I would reccomend this product to anyone who takes their dog in the car, whether it be for long trips or short rides to the groomer or vet." "I have a 10 month old siberian boy and he and I love the shock leash and harness great combo for our runs together if you have a strong dog then get these products to save yourself from stiff necks!!!" "Our chi had problems with other harnesses. It always seems to chafe him. When I saw this product I was sold on it immediately. Well build, easy to put on and the seat belt strap was an added bonus. Because of the quick and easy way to adjust the straps, we can also put the harness over his coat. This will keep him warm and will still allow us to go for a walk when it a little bit colder outside."